I feel like we're going from winter straight to summer. Temperatures were consistently in the 80s for the past few weeks. No complaints here! Going to the pool is one of our favorite things to do in the summer. The kids always have a blast. 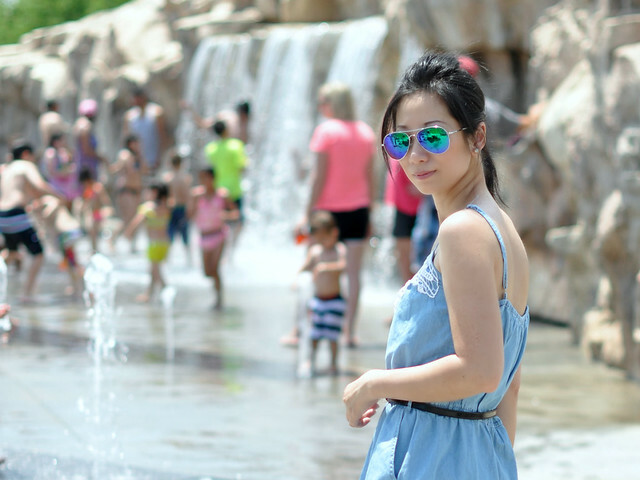 I wore this adorable rompers last weekend to a local splash pad. Rompers are my summer must have (don't judge!). They're comfortable, easy to wear and can also be worn as a cover up over a swimsuit. What's not to love, right? Here's to the sunshine and many more trips to the pool ahead! I am going to have to get my hands on that romper! It looks cool and chic at the exact same time! I love rompers and I love chambray! This is perfect! Love the hat and sunnies, too! Cute romper! Lovely lace detail. Looks like the splash park behind ya was pretty awesome too :). You look really cute in this romper, Sydney. I still haven't purchased one because I don't think I'd like the function issues for everyday wear. But as a swim cover - yes! Perfect. Love it paired with the mirrored sunglasses and fedora! Great romper! Love the hat and the shoes.. complete the outfit! This is adorable...I love the crochet detailing on it! I love rompers too but did not buy it because of the bathroom issue!